Students are customers. 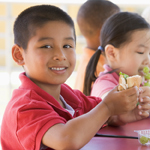 Participating in the school meal program is always a choice, so in order for students to decide to participate, you must ensure that they recognize the value of the school lunch. When marketing to students focus on what the benefit would be to them in participating in the NSLP. For instance, students want to socialize during meal times, so focus on speed of service. Students want a say in what they eat, so include them in testing new products, and provide them choices. Partner with student groups on campus to market the meals. Piggyback onto commercial advertisements to promote school meal choices. The resources below provide practical information and simple tools to market directly to students in an appropriate and positive manner.